Who are the Student Peer Chaplains? The Luther College Residence hosts multiple social events and programs throughout the year, such as Christmas Dinner, International Night, Mardi Gras, and Karaoke Night. The Luther College Residence is a great place for student athletes; it’s conveniently located and comes with a great meal plan. The Luther Library has over 24,000 items in its collection, 5,000 books checked out per year, and 7,000 students who come through its door per month. Luther students enjoy personalized one-on-one academic advising: our academic advisors are here to help you from registration to graduation. It pays to go to Luther College. Literally. Luther students are eligible for an additional $100,000 in scholarships, in addition to all of the awards available to them as U of R! Every single degree program at Luther College offers an optional experiential learning component; gain real world experience and get paid while you go to school! ALL U of R students including Luther students can take Luther courses. 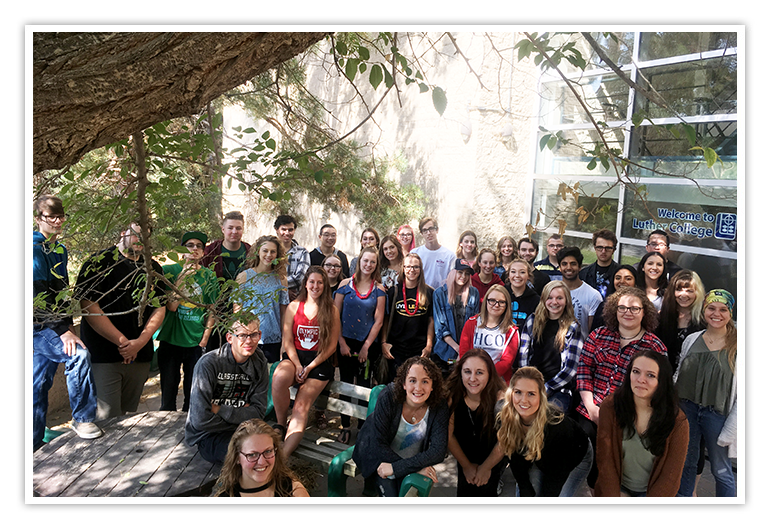 Luther College at the University of Regina participates in Admission on the Spot events - campus tours, reduced application fees, and the relief of finding out you're accepted to your program right away! UPrep is a three-day intensive orientation program for first year students entering the faculties of Arts, Science, and MAP (Media, Art, and Performance) and pre-professional programs at the University of Regina and Federated Colleges. Students will participate in an array of confidence building workshops, such as: Goal Setting and Future Planning, Learning Techniques, Library Necessities, as well as sit-in on academic lectures - and more! There is a maximum capacity of 45 students so make sure you register today! Interested? Fill out the form below to register for UPrep 2019. NOTE: There is a maximum capacity of 45 students for UPrep 2019. If maximum capacity is reached, students will be notified that they are on the waiting list and will be contacted if space becomes available. Questions? Contact Amy Dakue, Recruitment & Retention Specialist, at 306-206-2093 or amy.dakue@uregina.ca. Will you be living in residence in Fall 2019? I give permission for the Luther University Preparation Program ($100 CAD) fee to be added to my UR self-service student account. Once you submit this form, you will receive an email confirming your registration and more information about the program. If you do not receive an email confirmation within four business days, please contact Amy Dakue at recruitment@luthercollege.edu. Personal information on this form is collected pursuant to the Personal Information Protection and Electronic Documents Act (“PIPEDA”) and The Local Authority Freedom of Information and Protection of Privacy Act ("LAFOIP"). Luther College at the University of Regina will use your information all administrative and academic matters and your information may be shared with the University of Regina. Your information will remain confidential, and will only be used or disclosed as authorized under PIPEDA/LAFOIP. Should you have any questions about the collection of information, please contact Luther College at the University of Regina at 1.306.585.5144.